This summer I noticed the arrival of this, one of the finest vegetarian pies to be found in our fair city. As you can see it sports the usual suspects, e.g. 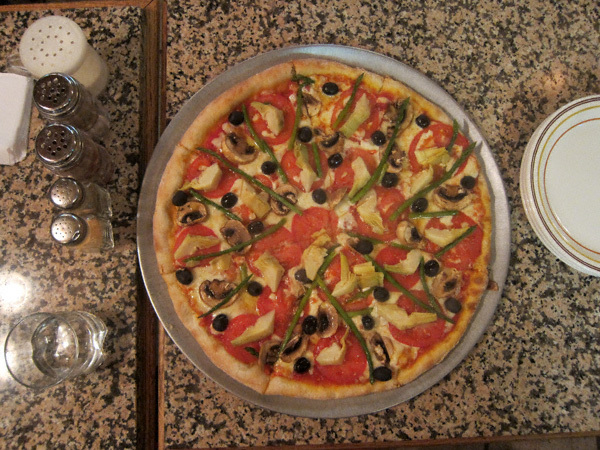 ; olive, mushrooms, tomatoes and (of course) cheese. What you may not be able to ascertain is it sports a couple unusual items as well: asparagus and artichoke hearts! Then as seemingly soon as this culinary delight came— it went. Well, as it would happen I was contacted by the chap designing Driggs Pizza’s new web site recently. I brought my despondency to his attention and he, in turn, brought it to theirs. Thus it came to pass that these kind folks were nice enough to whip me up my very own pie— and bring it back on weekends moving forward! This pie will set you back $4.00 a slice or $24.00 a pie. You have my personal word it is truly worth it. Give it a try!